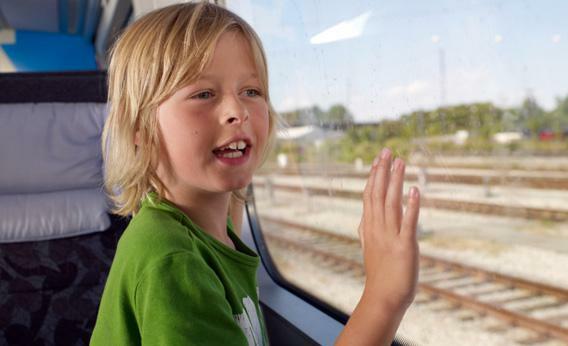 Unaccompanied minors: Why can’t kids travel alone on Amtrak? Why has Amtrak stopped letting children take the train on their own? Last February, exactly one year ago, my children spent three and a half hours by themselves on an Amtrak train ride from New Haven, Conn., to Philadelphia. It was a perfectly functional day that all of us remember fondly—the kind that makes you bless public amenities like train service. I was happy because I got to drop the kids off at the train station instead of spending an entire day making the trek to their grandparents’ with them and back. Eli and Simon, who at the time were 11 and 8, were pleased that they successfully fended for themselves (and ate all the pizza they wanted along the way). And my parents were of course glad to pick up the children from the nice attendant whose job it was to deliver them, and delighted to spend the long weekend with them. At the end of said weekend, the children made their way back, feeling like trusty Amtrak veterans. And also like people who could be trusted to sit calmly and read a book or play cards. Not grown-ups, but not little kids, either. When I picked them up from a second nice attendant, who conscientiously checked my ID before handing them off, I was filled with praise for rail travel and its allowance for a rare moment of childhood independence. Hooray for Amtrak! Hooray for giving children small but meaningful chances to show they can navigate some carefully cordoned parts of the world on their own! Actually, I take it all back. Because that’s what Amtrak has done, and I curse them for it. Children may no longer take the train alone, I discovered Monday, in a sad bit of news that has wrecked our plans for this February break and made me rue anew our hand-holding, paranoid culture. Amtrak has suddenly decided that Eli and Simon are no longer old enough to be trusted to ride the train by themselves. Never mind that they are a year older and wiser than they were last February, and never mind the nice attendants and the careful hand-offs to designated adults who present identification. Apparently, none of it is enough to keep our dear not-so-little ones safe anymore. Or maybe Amtrak just didn’t feel like dealing. In any case, for no apparent good reason they have changed the rules, which is infuriating and, as is so often the case with switch-ups like this, even worse than it would have been if we’d never had last year’s taste of freedom at all. I will try to stop ranting long enough to explain, or rather to let Amtrak explain. Previously, children between the ages of 8 and 13 could travel as unaccompanied minors in precisely the way I’ve described: One adult handed them off to an attendant at one end, with paperwork designating exactly who was to pick them up at the other end. As of last November, however, a child must be between the ages of 13 and 15 to ride the train under these terms. Eli will have his bar mitzvah—he will be an adult according to Jewish law—before he’s allowed to ride on his own again. And even then, Simon won’t be able to come along, because if you’re under 13, your older brother isn’t a good enough companion. Someone over the age of 18 has to be your chaperone. Emphasis mine, because come on. More customer-friendly? How is it “customer-friendly” to eliminate a plan that makes customers’ lives easier—especially when it has been operating without a hitch? No child has gotten lost or stolen or even locked in the bathroom, Amtrak reports. And hey, if the problem really is missing wristbands, how about pinning a note on a kid’s coat? It is a tried and true strategy that worked for all those children evacuated from London during World War II. Also Paddington Bear. I’m quite certain that Amtrak’s shifting attitude toward children has little to do with missing wristbands, but instead is about a company (is it a company even though it’s funded in part by our tax dollars?) streamlining procedures and minimizing inconvenience—for their benefit, not ours. When I reached Magliari, he said that in the last several years the trains have become busier. “There is more for the conductors to do, more fares to collect, and they need to be able to safely take care of everyone on the train, both under the age of 18 and over.” Oh that sanctimonious trump card of a word, safely. And it’s not just about the kids’ safety either—apparently the presence of children has become an endangerment to all the other passengers, too. Fearing that my kids may never leave home alone again, I checked on whether they can still fly as unaccompanied minors. And yes, happily, this still seems to be a possibility, for the right price, for children ages 5 and up, though often only if they are flying nonstop. I am glad to hear that the airlines have not become as childphobic as Amtrak, but the train is a lot more convenient and less expensive, at least if you live on the Eastern Seaboard. My children will not be flying from New Haven to Boston to visit my husband’s parents this week. And anyway, I wonder if it’s only a matter of time before the flights end, too. After all, surely there is some liability issue someone somewhere could raise, some possibility that something, somewhere in transit, could go wrong. Because increasingly, it seems to me, that’s what our society’s attitude toward kids boils down to: Stay away, they might break. This is particularly unfortunate because the far more present danger, child psychologists like Wendy Mogel argue, is that children will never learn to make their own way, to solve their own problems, to rely on themselves and their own good sense. But all of that goes by the wayside once risk-averse adults start imagining what might happen if kids are allowed to venture anywhere at all on their own. If, for just a few hours, they’re outside the control of their parents or teachers. They are such a drag, stupid officious policy changes like this one. They make children’s worlds that much more cramped and constricted, and they make parents’ lives that much harder. (If you see my husband stuck in traffic on I-84, give him a wave; he’ll need some cheer on his hours-long round-trips.) It’s all supposed to be for the good of the kids, but it’s not really for them at all. And so I have a plea to make, on behalf of Eli and Simon: Dear Amtrak, please let us back on the train! We’ll learn to love your railroad as we look out the window and watch New England roll by. You’ll help us grow up, just a little bit. And we’ll be good, like all those other kids who have gotten where they were going without incident. We promise.